Save an extra CDN$ 6.76 (32%). Buy the Kindle Edition instead. The wait is over! The Thing, the Human Torch, the Invisible Woman and Mr. Fantastic - the fi rst four heroes of the Marvel Age of Comics -are about to be reunited! Nothing is impossible anymore. Anything can happen. It's time. Jump in and be part of the grand return of the greatest family in the Marvel Universe! 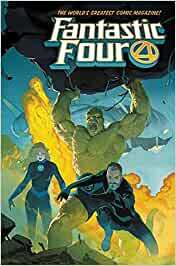 As an event occurs that will forever change the Fantastic Four, the next chapter begins in the life of Victor Von Doom. Meanwhile, Alicia Masters adopts two kittens. And no, they're not Skrulls. They're two normal, everyday kittens! FANTASTIC FOUR is a book about the grand, cosmic wonder of the Marvel Universe. It's also about family and real life. And people get pets. Stop obsessing about Alicia's kittens. Start reading Fantastic Four Vol. 1: Fourever (Fantastic Four (2018-)) on your Kindle in under a minute. It's not good. But I'm happy to see the original team back together after so many years with different characters, followed by nothing for a few years. Reed is handled well. Ben and Johnny are there most one-dimensional selves (amazing how Johnny hasn't changed since 1962). Sue is Reed's cheerleader. In an effort to defeat "the greatest threat to the multiverse ever" (Sue or Reed actually say this - ridiculous hyperbole), Reed brings in every FF member ever to fight a huge battle. That is over in one issue. Lame. Lame. Lame. Way too crowded with guest stars. The return of the FF should have been able to devote one helluva lot more time to the actual characters. This read like the writer made a list of things to include then just kept including them until he ran out of space. The major conflict had no real suspense and made next to no sense. Again way too many ideas were thrown at the reader all at once with no time to dwell on any of them. The major conflict and villain were introduced, declared to be Galactus level unbeatable, then the heroes told each other how wonderful they all were and then somehow just won. The art was not really a good Fantastc Four style. Kind of a mix between Archie and one of silver age DC's C list titles. I have been reading them since there 12 cent days, and this book merely reinforces my belief that no one other than Lee and Kirby ever really understood how to make this title work. I wish I could recommend this book, but I can't. I’ve was expecting more here. The return of Reed, Sue, and their kids was too easy. They’ve been gone for five years their time (less apparently on Earth 616) and believed dead (so I thought), and Ben and Johnny just went on a adventure to come to grips with these developments in Marvel 2-in-One that wasn’t even mentioned here nor was the sudden reappearance of Reed and Sue there. Instead, (SPOILER ALERT) some big bad threatens the Richards, and Reed tricks her into a mega Fantastic Four reunion/team-up. The only interesting addition here is that Ben finally proposes to Alicia. The next collected edition promises their wedding. Do be careful in ordering from Amazon. My copy arrived terribly mangled due to poor packaging. It's been a while since we've got the crew back together, and it was worth the wait. The story, dialog, characterization is all spot on. It's like meeting up with an old friend again; he may not have changed much, but he was always a great guy. That's this book in a nutshell.